Men's patriotic sport shirts have come into vogue as the political arena has heated up, with all sides trying to express their love of country through their casual wear. This leads to a wide range of styles to choose from for the discerning male. For decades, one way that men would show their patriotism was through a small lapel pin, usually of an American flag, worn on their suit. That and the occasional red-white-and-blue tie pattern were all it took to feel a part of the good old US of A. These subtle ornamentations let people know where a man's loyalties lie, without making them the definition of the man. This style has been carried over into a few different styles of sports shirts. The classic version is modeled after the famous "Izod" style - only instead of a monogrammed alligator or other symbol, a small flag is embroidered on the left side. Other party symbols may be used instead of a flag - donkeys, elephants, or campaign logos - but the common theme is usually red, white, and blue threads. Another subtle ornamentation is to use "trim" - edging the sleeves or collars in the red-white-and-blue, or with whatever combination complements the main color of the shirt (for example, on a white shirt, having red and blue piping on the collar and short sleeves). Sometimes the pattern on the trim will be more explicit - stripes and stars, for example. These are all ways for a man to still show his patriotic zeal when the traditional tie and lapel pin are unavailable. Thanks to advances in the textile industry, it is possible to be much more blatant in your patriotism just through your choice of sports shirt. 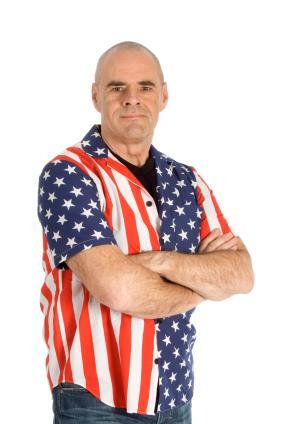 Putting an American flag pattern repeatedly over the body of the shirt is one of the first ways this technique was used, but a more popular and modern design is an offset abstract imprint, usually looking like an American flag, was actually cut up and used to stitch the shirt together. With this kind of pattern, not only can you show your love of the old stars'n stripes, you can even pick which version of the flag you want to show - the thirteen stars of the constitutional convention, for example, which would be appropriate for a Fourth of July barbecue. There are some who feel that showing the flag in this way is actually disrespectful to the flag - that it should only be shown in its fully-intact state, and that even the illusion of "wearing" a flag is actually unpatriotic. However, the flag is actually a symbol of freedom, not the freedom itself - and whether you choose to wear it, fly it, or even burn it, it's all an expression of that right to express your patriotism. For many people, showing their love of country through the colors of their sports shirt isn't enough - they also want to send a message with what they wear. From a simple "USA" to the fervor of "These Colors Don't Run!" you can usually find a shirt that says the things you want. Companies such as United States Flag offer a range of sports shirts and t-shirts festooned with a wide variety of patriotic messages. One thing to keep in mind when purchasing men's patriotic sport shirts - especially online - is to look at the material the shirts are made out of. It is much easier to print on synthetic fabrics, and some of the coolest designs may be put on rayon or polyester shirts. Remember that this kind of material won't breathe as well as cotton, linen, or other organic materials, and if you're planning on wearing the shirt in a hot or humid environment the shirt may not be as comfortable as it is colorful. If you're really enthusiastic about your patriotism, you may also want to pay attention to where the shirt is made - wearing one that shows an American flag but is made in China may not be the way you want to express your love of country.